On the First Round Capital website we write that: "We love investing in technologies and business models that are able to shrink existing markets. If your company can take $5 of revenue from a competitor for every $1 you earn – let's talk!" I've often been asked what we mean by that – so I thought it would be a good topic for a blog post. My first company, Infonautics, was an online reference and research company targeting students (mostly high school students). While I was there, I got a firsthand education on "asymmetrical competition." In 1991, when we started Infonautics, the encyclopedia market was approximately a $1.2 Billion industry. The market leader was Britannica - with sales of approximately $650 Million, they were considered the gold standard of the encyclopedia market containing "over 44 million words" written by scholars and "more than 80 Nobel laureates". World Book Encyclopedia was firmly ensconced in second place. Both Britannica and World Book sold hundreds of thousands of encyclopedia sets a year for over $1,000. However, in 1993, the industry was permanently changed. That year Microsoft launched Encarta for $99. Encarta was initially nothing more than the poorly regarded Funk & Wagnall's Encyclopedia repackaged on a CD – but Microsoft recognized that changes in technology and production costs allowed them shift the competitive landscape. By 1996 Britannica's sales had dropped to $325 million - about half their 1991 levels – and Britannica had laid off its famed door-to-door sales staff. And by 1996 the encyclopedia market had shrunk to less than $600M. In that year, Encarta's US sales were estimated at $100M. So in just three years, leveraging a disruptive technology (CD-ROM), cost infrastructure (licensed content versus in-house editorial teams), distribution model (retail in computer stores versus a field sales force) and pricing model ($99 versus $1000), the encyclopedia market was cut in half. More than half a billion dollars disappeared from the market. Microsoft turned something that Britannica considered an asset (a door-to-door salesforce) into a liability. While Microsoft made $100M it shrunk the market by over $600M. For every dollar of revenue Microsoft made, it took away six dollars of revenue from their competitors. Every dollar of Microsoft's gain caused an asymmetrical amount of pain in the marketplace. They made money by shrinking the market. At Half.com, we tried to do the same thing. We quickly learned that most readers of fiction books finished reading the book within two weeks after purchase. So we launched a very simple feature on our site. Say you purchased a John Grisham book from half.com for $15 (versus a market price of $30). Two and a half weeks later you would receive an email from Half.com offering "your money back" – users simply had to check a box and we would list their book for sale for $15. The vast majority of users would relist the book for sale -- and we found that for best selling books, we would sell the exact same copy of a book four times. That is, Buyer A would buy the book for $15, read it and sell it to Buyer B for $15, who would then read it and sell it to buyer C for $15, who would read it then sell it to Buyer D. Of course, we would take commissions from every sale – say $3 – and shipping charges – say $2 – from each sale. So for the four transactions, the out of pocket cost to the buyers would be $20. Now if half.com didn't exist, you can assume that the books would have been purchased through traditional channels for $30 each – for a total out of pocket cost of $120. Think about it. For every $1 of sales on half.com, we took $6 away from the existing traditional channel - another example of asymmetrical competition. This is the reason why I'm so excited about our recent investment in Jingle Networks. Jingle is the owner of 1-800-FREE411 – the country's first nationwide provider of free directory assistance. Launched late last year, the 1-800-FREE411 service offers consumers a free alternative to the high cost of 411 service provided by traditional carriers. By including a ten-second advertisement before giving out a phone number, 1-800-FREE411 saves consumers on average $1.25 each time they look for a phone number from their telephone. Since American consumers use traditional 411 services 6 billion times a year, 1-800-FREE411 has the potential to shrink an $8 billion market. I believe (and hope) that as consumers shift to ad-supported directory assistance, we will take a significant share away from the entrenched carriers. If you have a business that will shrink an existing market, allowing you to take $5 of revenue from a competitor for every $1 you earn, let's talk! A common assumption is that communicating face-to-face is more persuasive than email. That's not always true, according to a 2002 study. Researchers found that men are often more responsive to email because it downplays their competitive tendencies. On the other hand, women react better to in-person encounters because they are more relationship-oriented. These same researchers found that someone will help another person if they feel a high level of "oneness" with the person--that is, the extent to which they indentify with the other person. When the oneness was low between men, email was much more effective. When the oneness was high for women, face-to-face interactions were much better. Whether pitching an idea, working with a new client, or finding a job, we often have to take risks and reach out to people we don't know. We don't want to perpetuate gender stereotypes, but this research is useful to keep in mind as we make those cold calls. Based on what we know about the person, does email or face-to-face interaction make more sense? Face-to-face isn't always the answer. In parallel to the Web and mobile devices, a new marketplace for applications and services is becoming accessible to entrepreneurs and developers — the Digital Car. Over the last five years, consumers around the world have started bringing their own "off-deck" communications and infotainment solutions into their cars, including mobile phones, personal navigation devices, iPods, satellite radios, DVD players and more. The market for in-car electronics and services has surged to $27 billion over an installed base of 210 million cars, according to the Consumer Electronics Association. As a result, a whole industry has sprung up around selling car-related technologies through dealerships, retailers (such as Best Buy and Circuit City), and online vendors (such as Amazon and Walmart.com). In addition, media companies such as Clear Channel and XM/Sirius have emerged, delivering audio entertainment and text data such as traffic to drivers. Yet, despite this barrage of new devices and services coming into the car, automobile manufacturers (OEMs) continue to turn out vehicles equipped with 3-5 year-old navigation products; tightly control human-machine interfaces (HMIs) including in-dash touchscreens, voice interfaces, side-controls and telematics offerings; and they still tediously vet new technologies through their Tier 1 and Tier 2 suppliers. Meanwhile, their margins and bottom lines have been sustained through relentless supply chain management, aggressive branding, channel control and jealous protection of high-margin components such as air-conditioning, stereo systems and navigation. Most consumers would point to only a few major innovations in the auto OEM market in the past several years, namely, Bluetooth, iPod integration and hybrid electric cars. Consequently, early-stage venture investors have historically stayed away from investing in automobile information technologies. But today's "closed-garden" automobile eco-system is now opening up to application developers. While there is no dominant computing platform to build to for cars, automotive OEMs are feeling the pressure from consumer electronics devices and are slowly adopting third-party technologies – witness Ford's successful introduction of the Sync, the recent awarding of telematics and connected services contracts by Chrysler and Mercedes to Hughes Telematics, and BMW's collaboration with Google. Entrepreneurs and developers aren't waiting for the OEMs to lead the way, of course. With the large-scale consumer adoption of electronics devices in the car and wireless connectivity for CE devices, they're starting to build new companies for this Digital Car marketplace. These application companies (some of which are mentioned below) are combining cloud computing resources with cheap wireless connectivity, access to any information or services on the Web, GPS location technology and new ad-supported and subscription business models. As a result, applications built around location, social media, communications, entertainment and a greener lifestyle are now all possible. Mobile applications vendors — mobile applications (whether server-based or device-resident) can be used on mobile devices in the car but with a greater emphasis on voice interaction and location. Interesting areas to target include the iPhone and GPS-enabled phones. While this is a fairly well understood ecosystem, mobile user interfaces are not well suited for the driver, and it's still a challenge to work with mobile operators for on-deck distribution and monetization or to market directly to consumers through mobile ads, the iPhone App Store or GetJar. Still, we're seeing some successes. Telenav,Yelp, uLocate's Where(a Venrock company), and Google Maps Mobile are good examples of driver-friendly applications. Voice applications providers — dialing by voice is something all drivers are used to and several new server-side voice applications are now coming to drivers' aid. Extending beyond hands-free dialing, these services cover access to email, news, podcasts, voice texting,	music, etc. Some vendors such as TellMe, Free411, Dial2Do, and DialDirectionscould start distributing third-party voice applications. Personal navigation device vendors — Connected GPS devices running Win CE and Linux are being launched, with Dash and TomTom being prime examples. Garmin,Magellan, Mio, Navigon and other OEMs are also going to be launching connected PNDs in the next 12 months and are looking for innovative applications. Telematics service providers — vendors such as Hughes Telematics, ATX, OnStar andWireless Car are signing up automotive OEMs. You could include Microsoft in this category as well with its Ford Sync launch. While this revival in telematics is still new, there's a chance for developers to distribute through these vendors. Original Design Manufacturers (ODMs) — ODMs in Asia such as Foxconn and Inventecare producing function-specific devices for use in the car. A developer could partner with these to go to market. Vendors such as PLX and Slacker are in this market. The downside is that entrepreneurs have to get their own distribution through retail chains, dealer networks and online retailers. Electric car companies – new auto OEMs including Think, Reva, Tesla, Better Place andFisker are entering the market and are willing to make much faster decisions, so developers may want to target these companies. The downside is that volumes are small and uncertain currently. VentureBeat listed a whole set of these companies here. Automotive OEMs – developers could target auto OEMs as a horizon 2 strategy — computing platforms are getting better with 400-500 Mhz processors, 100+ GB hard-drives, etc. For example, BMW, Intel and WindRiver are working together on a Linux solution for the car through Moblin.org. Expect three- to seven-year decision and deployment cycles, although connected services strategies will enable automotive OEMs to iterate and deliver new applications over-the-air much faster in the next few years. Dev Khare is vice president of VC firm Venrock in Palo Alto, Calif. He has a background in product management, marketing and international finance. Can it get any worse for the newspaper industry? The steep decline in print advertising just keeps getting steeper and, for the first time, even online ad sales have gone down. Total print ads in the U.S. were down 16 percent in the second quarter to $8.8 billion. 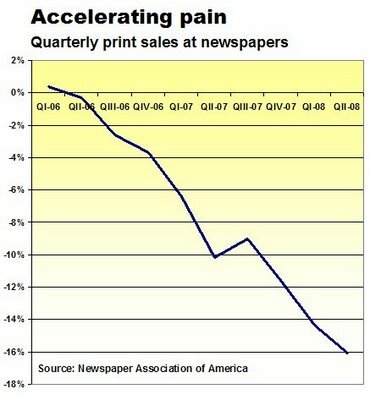 That makes nine consecutive quarters in which "print revenues have declined at an almost continuously accelerating rate," notes Alan Mutter at Reflections of a Newsosaur . He put together the chart at left, which starkly illustrates the newspaper industry's death dive. The newspaper industry took in $1.7 billion less in print ads during the second quarter than the year before For the first half of the year, the industry is down $3.1 billion. At this rate, there won't be an industry left by the end of next year. Of course, revenues have to stabilize at a lower level before that happens. Don't they? Rght now, we're at 1995 revenue levels. Don't look to online ad sales to save the industry. Online ads came to only $777 million in the second quarter, which was down 2.4 percent from the year before. That's marks the first decline ever in digital revenues. The practice if bundling print and online ad sales isn't helping in this case, either. Advertisers trained to buy bundled ads are more likely to drop the entire bundle when making budget cuts. The advertising recession is in full swing, and no segment is safe any longer.